"What is desperately needed and seldom found in the church is an adequate theology of the family of faith. Paul believes that being brothers and sisters in Christ and sons and daughters of God transcends all other loyalties and should transform all other social relationships. Blood should not be thicker than the baptismal waters in the church. Rather, Paul calls for a 'relativized' view of all this-worldly institutions, including marriage. His idea of a family 'church' is actualized where God's people treat each other as their primary family, not just as some secondary social gathering that happens once a week and that promotes the agenda of the nuclear family. This is not to say that Paul is against the physical family. He does, however, believe that in the eternal scheme of things one's loyalty to Christ comes above and before one's loyalty to any other group or entity and that therefore one's loyalty to the body of Christ should likewise be at the top of one's priorities." "9 And he said to them, ‘You have a fine way of rejecting the commandment of God in order to establish your tradition! 10 For Moses said, "Honor your father and your mother"; and, "Whoever reviles father or mother must surely die." 11 But you say, "If a man tells his father or his mother, Whatever you would have gained from me is Corban" (that is, given to God)-- 12 then you no longer permit him to do anything for his father or mother, 13 thus making void the word of God by your tradition that you have handed down. And many such things you do.'" This is, of course, dealing with works rather than faith (and other themes) but, like it, we can neglect our families and use the church as an excuse. So, among the "lost", should our physical family be our priority? Yes, in the grand scheme of things, "water" is (and must be) thicker than "blood." Jesus himself said as much. consider Matthew 8: 18-22 & 12:46ff. There is indeed a call from the Master to reevaluate your prioities and thus your loyalties as to who has first place. Anything that conflicts with that devotion to Jesus and his church (and yes his family) as first love is biblically to be subordinated to "seeking first his kingdom and his righteousness." Anything that comes between that indicative and the imperative to follow at all costs is to be questioned with all seriousness. 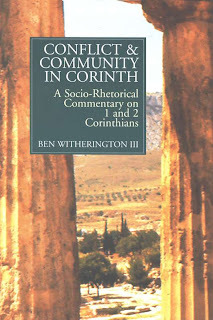 I really want to pick up that commentary from Witherington. I agree with what Dr. Witherington is saying. As a Christian, with a "birth" family who is entirely made up of non-Christians, it is difficult at times. Like on Christmas, I come to church on Christmas Eve, and everyone is all happy with their families, and they leave to celebrate with one another and pray, and sing songs (or whatever Christian families do on Christmas, I honestly don't know...). I am stuck surrounded by a lot of intoxicated people, eating sushi or whatnot. I oftentimes wish that I could just stay at church, and hang out with my church family as I celebrate things such as Christ's birth, death, and resurrection. I know that I am not alone in this, and I know that some of our brother's and sister's have worse situations where they have no family at all, and no one from the church takes them in as a family member.